Shannon - I noticed the rose on Lauren´s door too. I wonder how it got there.lol Too bad she wasn´t walking around with OUR flowers.haha. Thanks for finding it, Debbie, and Craig for the Yt link. Thanks Michelle and Shannon. Now it makes sense lol. It's Lauren's BFF! He definitely has his work cut out for him (it's worse than at Guys and Dolls). I wish he were still guarding Lauren, but it was nice to see him because it made me think of G&D. Thanks for the picture Claire. That's great Claire!!! I remember us talking about how he is in every single pic with Lauren. I can imagine with Daniel and Hugh that stagedoor must be nutty. 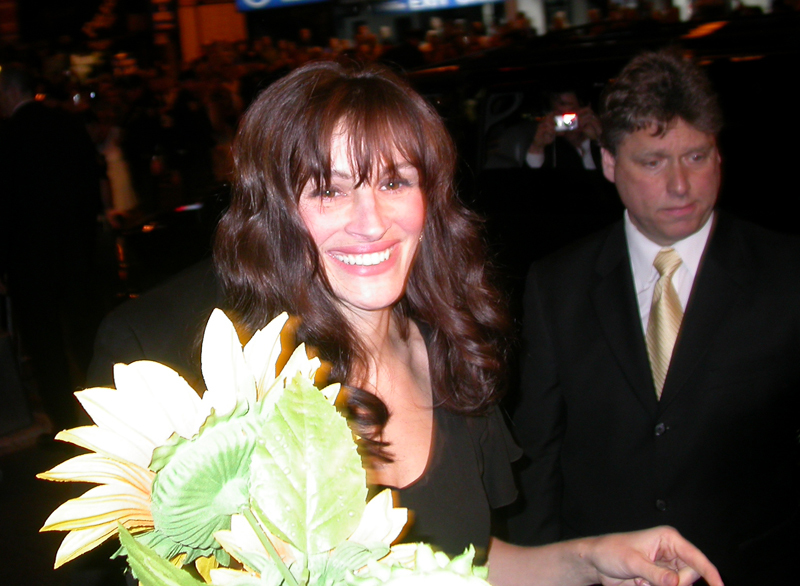 It was at the Bernard B. Jacobs theatre for the play "Three days of rain" in April 2006. Paul Rudd and Bradley Cooper were in it too. Lol, he is famous. Thanks Claire. Would be funny if he remembers you. LOL. Julia had a REAL bodyguard, too. Man, I'm jealous. She was my Lauren before Lauren came around. I was looking at the HQ pic we got of Lauren in the skimpy outfit with the other girls (Who wouldn't?) and the mystery mark on her leg. Sorry if this was bought up before but I noticed one thing missing, her left garter., could the 'mark' be where the garter is meant to be attached?